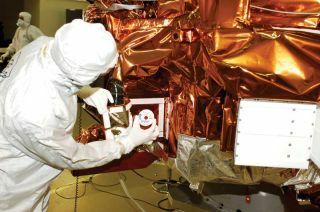 Engineers attach a DVD containing messages from Earth to the Kepler spacecraft, a probe launched in 2009 to search for extrasolar planets. Althoughthe main payload onboard the Kepler spacecraft consists of instruments todetect other worlds, a second package reminds anyone who may intercept thecraft millennia from now of the hopes of the generation that launched it. Overa six-month period, tens of thousands of people submitted messages explainingwhy they thought the Kepler mission is important. These were gathered onto aDVD and attached to the spacecraft. Many of themessages highlighted Kepler?sscientific objectives. Chris Hall, from Virginia, noted that ?This missionserves to expand our exploration of two of humanity?s deepest questions?arethere otherworlds out there like our own, and if so, are there other entities who maybe seeking knowledge of us?? Many described this scientific mission as amanifestation of a need to reach out into space. As Wanvisa Permtongchuchai ofThailand put it, ?Exploration is the nature of humankind.? Indeed, some spokeas if they had no choice but to participate, as in Martha Harris of Kentucky?sstatement that ?The Kepler Mission is humanity?s cry in the dark. I can?t notbe a part of this ? even if only in name.? Othersemphasized humanity?s curiosity, as in the message of Anthorr Nomchong ofAustralia: ?curiosity is what drives us and what we will be able to share if wedo find out that we are finally not alone on this small cosmic speck of dust. ?Annabelle Bresnahan of New York reminded us that such curiosity knows no agelimits: ?The one thing my daughter doesn?t question is her own curiosity. Kepleris important because we are all still children.? Stillothers stressed that finding other worlds can give us a greater appreciation ofour own world, as well as increased self-understanding. Bob O?Donovan of California,for example, suggested that ?Space exploration and the discovery of othercivilizations is by far the greatest challenge of humanity. The immenseness andwideness of space makes us appreciate the fragility and divine beauty of theEarth.? A similarposition was expressed by Abraham Samma of the United Republic of Tanzania whenhe wrote, ?The searchfor other worlds with perhaps other intelligent beings is a noble plan. Weas humans would hopefully get to know and love our home more if we continue tofurther our knowledge of other worlds.? Christina Aas of Norway emphasized thevalue of increased self-awareness: ?It would be a great waste if we were theonly living beings in the entire universe. By searching for other life formsout there we might learn more about ourselves in the process. We will hopefullyalso see that whatever conflicts exist between people, in the larger picture weare all the same ?? While someof the people submitting messages recognized the distinct possibility of not detectingEarth-like planets in othersolar systems, most were optimistic. And as Keith Mansfield of the UnitedKingdom observed, the discovery of small, rocky planets around other suns wouldbe especially fitting, given the spacecraft?s namesake: ?If Kepler finds manyterrestrial-style planets we can target some of our SETI in their direction. Ifit finds none, then we would have to reevaluate our ideas about our position inthe universe. That seems unlikely though. It was Kepler himself, bydemonstrating that orbits are ellipses rather than circles, who helped shifthumanity?s viewpoint in the first place. No longer was it even possible for usto be at the very center of everything. It would be a surprise if the telescopenamed after the man were to indicate that we are, after all, uniquelyprivileged.? Dr. Vakochis Director of Interstellar Message Composition at the SETI Institute. His workis supported through the Adopt a Scientist program by Jamie Baswell.